Select Bus Service on Woodhaven and Cross Bay Boulevards is coming to Queens in two phases. The first round, due early this fall, will bring nearly two miles of painted bus lanes and a road diet for service roads along more than a mile of Woodhaven Boulevard [PDF]. DOT has said it will release a design for the second phase later this fall. We don’t know yet whether DOT will start to make good on Bill de Blasio’s campaign promise to build “world-class” Bus Rapid Transit. But a 2009 study of Woodhaven Boulevard offers a taste of the most basic BRT improvements the agency could propose, plus a cautionary tale for advocates. The route DOT and the MTA are studying for SBS stretches nearly 14 miles from Woodside to the Rockaways, with the initial improvements focusing on a shorter stretch of Woodhaven Boulevard. The agency will be adding offset bus lanes, running in each direction next to the parking lane, from Eliot Avenue to Metropolitan Avenue — about 1.4 miles, or one-tenth of the total project corridor. These lanes will be in effect only during rush hours, from 7 to 10 a.m. and from 4 to 7 p.m. The southern end of the new bus lanes is immediately north of a bridge over Long Island Rail Road tracks, where Woodhaven has three car lanes in each direction. 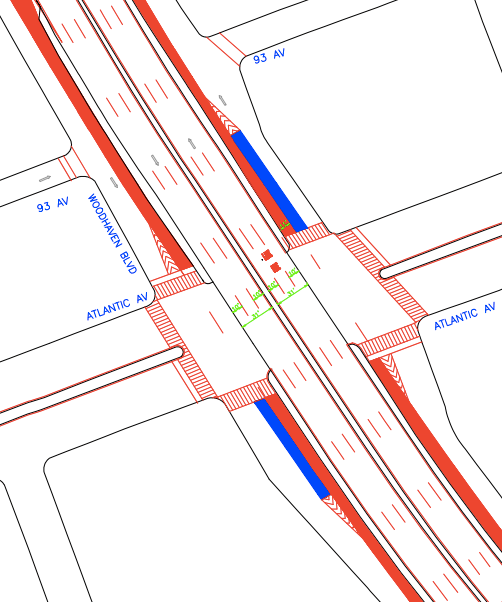 By reducing the number of general traffic lanes north of this pinch point to the same number as the bridge, DOT can demonstrate how Woodhaven functions during rush hours with less space for cars and more for bus riders. The second section of bus lanes covers slightly more than a half-mile in Ozone Park. There, curbside bus-only lanes will replace parking as Woodhaven and Cross Bay Boulevards approach the complex intersection of Rockaway Boulevard and Liberty Avenue, where many bus riders transfer to the A train. Like the bus lanes north of Metropolitan, these lanes will be in effect from 7 to 10 a.m. and 4 to 7 p.m., except for the final block of each approach, where the lanes will be for buses only between 7 a.m. and 7 p.m. According to DOT’s presentations, the agency expects the first phase to improve bus speeds by about 10 percent [PDF] on the sections with bus lanes. 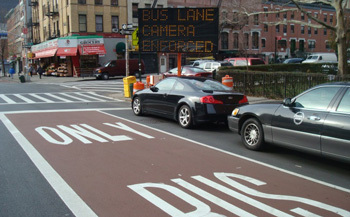 The bus lanes are unlikely to be camera-enforced, since state law allowing the use of cameras restricts them to just one Select Bus Service route in Queens, and DOT has already said that it will use cameras on the M60 SBS route, which runs through Astoria to LaGuardia Airport. In addition to the bus lanes, this phase of work will calm traffic and add some pedestrian space along service lanes. Nearly two miles of Woodhaven, from Union Turnpike to Rockaway Boulevard, has service roads on each side. Most of these are two lanes wide, plus parking. More than half of that stretch, covering 1.3 miles from Park Lane South to Rockaway Boulevard, will be getting a road diet this fall. The new configuration will have one travel lane, a parking lane, and a five-foot buffer, freeing up space for larger pedestrian islands at intersections. The exceptions are 91st and 97th Streets to provide room for trucks turning from the main road, and Jamaica Avenue, where the median is already widened, DOT said. Many of these proposals were first discussed in a DOT “Congested Corridors” study from 2009 that suggested improvements along the entire length of Woodhaven, from Queens Boulevard to Liberty Avenue. Since the study was released, DOT has implemented a number of its recommendations, including curb extensions, lane reductions, and pedestrian islands at some of the boulevard’s most dangerous intersections [PDF]. But the study also outlined ideas that went far beyond modest tweaks. It also showed potential designs for Woodhaven Boulevard featuring separated bus lanes, bigger pedestrian medians, and even protected bike lanes [PDF]. The bus lane design envisioned exclusive transit lanes from Eliot south to Metropolitan, like those being implemented this fall. The lanes would then disappear for about a half-mile over the narrow LIRR bridge, reappearing just south of Union Turnpike and extending all the way to Rockaway Boulevard. The entire route, running nearly four miles (including the LIRR bridge gap), could be either on the main road or the service lanes, which could include bus bulbs to provide a space for waiting passengers. Instead of creating a center-running BRT line, the 2009 proposal suggested using existing medians and lanes to carve out space for buses. DOT has said it plans to spend about $200 million on Woodhaven SBS, with staff comparing it to center-running BRT projects in Cleveland and San Francisco. Presumably, that would make the concepts in the 2009 plan a floor, not a ceiling, for the proposal DOT is expected to release later this year. The plan also recommended turning some of the streets that branch off the dangerous intersection of Liberty Avenue and Rockaway Boulevard into pedestrian plazas. In a cautionary tale for advocates, the city made preliminary proposals to pedestrianize those areas in 2010, but the plan faced criticism from local politicians and was downsized prior to implementation. Then the improvements were scaled back again, when local merchants said they wanted two-way car traffic restored on one block of Liberty Avenue in 2012. In the end, DOT did cut the number of crashes by expanding pedestrian islands and adding turn restrictions, but a truly pedestrian-friendly transit and retail hub never came to pass. When the inevitable pressure to water down the Woodhaven BRT plan surfaces, will DOT Commissioner Polly Trottenberg and Mayor Bill de Blasio stand firm? Support from local elected officials is crucial. Republican Council Member Eric Ulrich, who represents Woodhaven, Ozone Park, and Howard Beach, has already penned an op-ed in support of center-running BRT. But Democratic Assembly Member Phil Goldfeder, who represents much of the same area, has positioned himself as an early critic. In the meantime, work on the plan continues at DOT. The agency said it will announce a date for another public meeting on the project this fall. Any more and it will be homeopathic. Lets hope the plan that comes out this fall is a lot more ambitious. Will the designs for the 2nd phase replace this? Will they include the entire corridor? The first phase is a part-time, curbside bus lane, not BRT; and definitely nothing even close to “World Class BRT”. With 126′ of ROW (10 travel lanes + 2 parking lanes + 3 medians) and $200 million dollars to work with, let’s hope phase 2 is significantly better than this. Kids who were born when the congested corridor report was produced are entering kindergarten this year. Is there any sense of urgency here? What are they planning? Studding the roadway with gold? $14 million/mile dollars is insane to take lanes that are basically service-ready. Utah barely spent more per-mile on a crude light rail line, and that presumably required far more new infrastructure. Wow, if only there were a parallel, above-grade right-of-way where a subway line could run. Oh wait, there is — the Rockaway Beach Branch. I’m all for BRT on Woodhaven, but a separated Right-of-Way that doesn’t have to deal with cross-streets and traffic lights is far better transit. Far more valuable than another High Line. They’ve mentioned new wider, landscaped medians, bike lanes, bus lanes, bus loading platforms (extended sidewalks), pedestrian safety advancements. What’s the condition of the road? Do they need to do any roadwork like repaving, utility work, or road bed reconstruction over the next ten years? Maybe they want that done now as part of the project. It’s the most dangerous road in Queens right? Maybe before adding more pedestrians (transit riders) to it they want to make what road design changes are necessary to make it safer to cross. Earlier SBS project costs were substantially lower. Woodhaven SBS seems to be part of a larger road redesign. Hard to say though, since they haven’t said what they plan to do with the money just yet. But based on the costs of previous SBS projects it seems reasonable to assume this is buying more than just a bus lane. It’s a road in NYC. Presumably it is undergoing a constant process of intermittent repavement, maybe more frequently than other routes given Woodhaven’s heavy (truck and bus?) traffic. If it’s part of a larger road redesign, many of those elements belong in a “road redesign” budget, not a BRT budget. That’s fine, of course, but that’s not being cited as BRT costs. And is still sounds high for pavement that is already there. What are offset bus lanes? And … any reason the Pratt Center’s Dec 2013 terrific report on BRT rationale and routes wasn’t mentioned? http://prattcenter.net/sites/default/files/pratt_rockefeller_brt_nyc_whitepaper_for_web.pdf. It had a heavy emphasis on Woodhaven BRT. All the same: great reporting. It’s a bus lane set a lane away from the curb (e.g., for bike lanes or parking). I’m all for RBB, but I don’t think it substitutes for a surface line on Woodhaven. 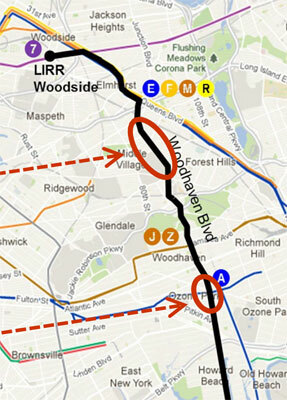 RBB is about expanding the subway network, and Woodhaven BRT is about better localized transit. Woodhaven BRT and RBB are complements, not competitors. Unless they’ve significantly increased that in later budget negotiations or aren’t doing any other SBS projects for the next four years apart from Woodhaven it looks like most of the money won’t be from the SBS pot. To the streetsblog writers: have you or has anyone else written any stories investigating where the funding for these SBS projects comes from, if they are dumping the costs of not necessarily transit related items into the pot of money for transit projects hoping nobody will notice, allowing them to get the good press of announcing increased funding for transit and then spend it on other items? If not, it would be nice to see an accounting of these projects, especially woodhaven moving forward given the higher cost. The information I’m acting on is in the article we’re posting on and the accompanying link. It says the plan is $200M on Woodhaven BRT. The RBB is within 5 minutes walk of nearly the entire length of Woodhaven Blvd. If the RBB were to open, it would draw so much of the Woodhaven bus traffic that nobody would consider BRT on Woodhaven any more. At a cost of $200M for a partial bus lane, it would better to just invest in the subway.